Cesar Villa-Garcia’s passion for technology started as a child when he’d play with computers to figure out how they work. At age 10, he came to the U.S. from his native Peru, and taught himself how to code and design. By middle school, he was developing websites and creating computer graphics. After graduating from Miami Dade College, he took three years off to save money and help his family financially. In 2014, he came to FIU to earn his bachelor’s degree in computer science on an FIU Presidential Scholarship. Cesar established the FIU chapter of the technology organization Upsilon Pi Epsilon (UPE), serving as its president. He grew the organization from 25 active members to 500 in four years and established eight programs aimed at promoting technology. 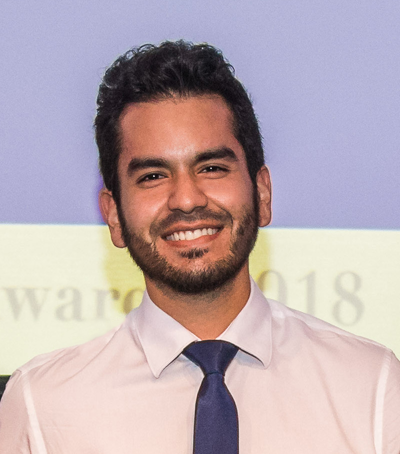 Cesar has raised close to $150,000 in sponsorships for UPE in the past year with support from companies such as Google, Microsoft, Amazon, and Facebook. He received a Google grant to start UPE’s community outreach program in Miami-Dade County Public Schools. Fifty volunteers visit 15 schools weekly to inspire students to pursue computer science careers. UPE also organizes the ShellHacks hackathon, which this year attracted 700 students from around the world to learn about coding and build projects together. Under his leadership, FIU’s UPE was named “Outstanding Chapter” out of 300 chapters nationwide. Cesar has interned with JPMorgan Chase in Chicago as a software engineer and is interviewing for various job opportunities.